Durable rubber anti-fatigue mat with slip resistant properties. Bubble surface stimulates blood circulation helping to reduce worker fatigue. Thickness: 14mm. Available in mats or interlocking sctions to create runs of matting. Standing and working on your feet all day can put a tremendous amount of strain on your body and can cause you to become tired, which influences a lack of concentration. Our bubblemat can help you tackle fatigue in your workplace, making your employees more comfortable throughout their working day and encouraging a higher level of concentration due to being less fatigued. 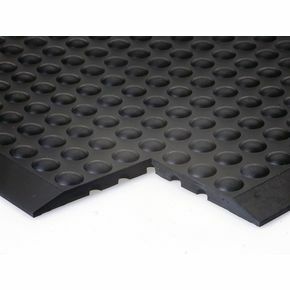 They are durable rubber anti-fatigue mats with slip resistant properties; the bubble surface stimulates blood circulation which helps to reduce worker fatigue. They have bevelled edges which makes them safer as they are less of a trip hazard and they provide insulation again cold concrete floors. They are available as a whole mat or interlocking pieces to create a bespoke sized mat to fulfil your requirements. They are available in two lengths; 900 or 1200mm and a choice of two widths; 600 or 900mm. Our bubblemat will help reduce mental and physical strain from your employees while working for long periods of time standing up. They are available with a 12 month guarantee and FREE UK Delivery.